Park West Foundation Director, Diane Pandolfi (right), presents the Visual Arts Outstanding Interpretation Award to Kassandra Burger from Mentor High School PTSA at the 2017 National PTA Convention in Las Vegas. The Park West Foundation was once again a proud supporter of the National PTA and its Awards & Reflections Celebration, held June 24 in Las Vegas. 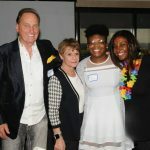 Since 2016, Park West has been a proud supporter of National PTA’s Reflections program, a student arts competition with an annual theme that encourages young artists to submit artwork in the categories of dance choreography, film production, literature, music composition, photography and visual arts. This year’s Reflections entries had to reflect the theme “What’s Your Story?” Below is a video highlighting the winners from this year’s contest. To view the award recipients and their entries, watch the National PTA’s slideshow.